Sir Mick Jagger has confirmed there will be Rolling Stones gigs before the end of the year. There has been speculation for weeks that the group will play live once again with shows in London and New York. And frontman Sir Mick told Radio 2 presenter Chris Evans the band would play a small number of shows this year before a longer series of dates. The singer, who called the breakfast show, said a detailed announcement would be posted online. "I'm sure there's going to be something on Facebook very soon about the tour. It's not going to be a long tour, the first bit anyway," he said. Sir Mick then teased: "It's going to be a few gigs. It's going to be much sooner than July. It could be as soon as the end of this year." One US music website reported six weeks ago that the band were lining up their first live dates for five years. It suggested there would be four dates in November - two at the O2 Arena in London and a pair at the Barclays Centre in Brooklyn. The Stones, who this year celebrated the 50th anniversary of their first gig, last played live during their A Bigger Bang tour which wound up in 2007. One ticketing website emailed subscribers last month with March dates earmarked for O2 performances by the band, although the Stones' publicists said at the time no concerts had been confirmed for this year or next year. The group have recorded two new songs - Doom And Gloom and One More Shot - which will be included in a repackaged greatest hits collection called Grrr!, which is to be released on November 12. Speaking of the sessions for the new songs, Sir Mick told Evans: "It was a very quick recording session." There have also been rumours that the Stones will play Glastonbury next year. Sir Elton John has remembered Aids sufferer Ryan White on the red carpet of his annual Aids foundation benefit. A show to mark Pete Waterman's years of creating chart hits has been rescheduled after it was axed in the summer after safety fears. Gary Barlow has lined up his first solo tour for 13 years with a string of dates beginning next month. Chart superstars One Direction are to collect the prize for the best UK and Ireland act at next month's MTV European Music Awards. 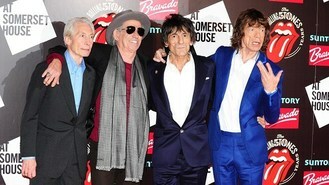 The Rolling Stones have confirmed their first live shows for five years with four gigs, including two nights in London. The Wanted apparently ended up with some bumps and bruises after filming their new music video. Carly Rae Jepsen has said her tour mate Justin Bieber's energy is "contagious".